(A) Reconstruction of Ambulocetus, ‘at the end of the power stroke during swimming’, by Thewissen et al. (B) The stippled bones were all that were found. And the bones coloured red were found 5 m above the rest. With the ‘additions’ removed there really isn’t much left of Ambulocetus! Fossilized bones found in Pakistan are claimed to be those of a ‘walking whale’,1 supposedly an ancestor of today’s whales. The main claim of Thewissen et al. is that this was a walking whale. That is, had hind limbs which functioned as legs on land and paddles/flippers in water. The skeleton is incomplete, with critical parts missing. It is also highly fragmented. To establish hind leg function it is necessary to have the pelvic girdle to demonstrate that the leg bones (femur and small proximal piece of tibia) belong to the rest of the skeleton and to determine muscle attachments. The pelvic girdle is missing! With the forelimbs, the humerus and scapula are missing which are again crucial to interpreting function, as well as establishing connectedness to the skeleton. Thewissen et al. use their own list of purported whale characters to establish Ambulocetus as a whale, but as Berta3 points out, some of these characters may have a broader distribution than whales. Thewissen et al. use a phylogenetic definition of a whale. That is, they assume common ancestry (evolution) and so justify including the supposed ancestor with the whales, choosing characters which were common as their criteria. In the footnotes, the authors mention one major difference viz. ‘Unlike most other archeocetes, the pterygoid processes are enormous …’, but there are many big differences, including the degree of variation and specialization of vertebrae. A major characteristic of whales is the horizontal tail flukes. Involvement of the tail in swimming requires strong caudal vertebrae with large processes for muscle attachment. Thewissen et al. show one ‘caudal’ vertebra which has almost no processes for muscle attachment. Furthermore, this one caudal vertebra was not even found with the rest of the skeleton, being ‘referred material’, found 5 metres above. In other words, the whole of the lumbar, pelvic and caudal parts of Ambulocetus were ‘constructed’ from just one lumbar vertebra, one femur, a small piece of tibia (no fibula, no pelvis), a small piece of the ball of the ankle joint and a few foot and toe bones. And yet a detailed description is given of how the animal moved in water and on land! The robust femur and presence of a hoof suggest that Ambulocetus was a land-dwelling creature. The paper was received by Science journal on 28 October, 1993 and accepted on 3 December, 1993, indicating that the paper passed the refereeing process with no, or only minor, changes being required before publication, and yet the paper is full of highly conjectural material. The reconstruction of the skeleton assumes it is a ‘whale’. The authors said, ‘Little is known about the tail, but there are always many caudal vertebrae in primitive cetaceans and their relatives’ and so they sketched in a long tail for Ambulocetus! There are several paragraphs of conjecture about locomotion on land and in water and yet there is not even a pelvis or any associated vertebrae! The movement of the forelimbs is also presented in detail and yet there is no humerus or scapula! If a paper of this quality was submitted for publication in an empirical field of science such as molecular genetics it would be rejected outright. Why then was this accepted so readily? It’s probably an indication of the status of paleontology as a ‘science’ and also the desperate desire of neo-Darwinian evolutionists to find some fossil evidence of an ‘intermediate’ form to reinforce belief in gradualism or indeed in evolution itself, as the lay newspapers obligingly and uncritically report the ‘find’. The Ambulocetus fossil was found in ‘lower to middle Eocene’ beds. Fossils of whales of the suborder Archeoceti have been found in lower Eocene strata,4 so Ambulocetus is unlikely to be an ancestor of modern whales, as claimed by Thewissen et al. There are too many crucial parts missing to be sure what Ambulocetus is. Whatever it is, it is unlikely to be a walking ancestor of the whales. For updates on Ambulocetus and refutation of critics, see the Addenda below. Thewissen, J.G.M., Hussain, S.T. and Arif, M., 1994. 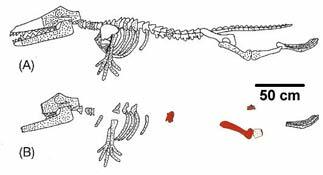 Fossil evidence for the origin of aquatic locomotion in Archeocete whales. Science 263:210–212. Return to text. Prothero, D., Manning, E.M. and Fischer, M., 1988. In: The Phylogeny and Classification of the Tetrapods, M.J. Benton (ed. ), Clarendon, Oxford, Vol. 2, pp. 201–234. Return to text. Berta, A., 1994. What is a whale? Science 263:180–182. Return to text. Encyclopædia Britannica, 15th Edition, 1992, Vol. 23, p. 434. Return to text. To see how so much is made of so little evidence, in the pro-evolution book Teaching about Evolution and the Nature of Science produced and avidly promoted by the National Academy of Science, 1998, the sketch at right of Ambulocetus is used as an illustration of a transitional form. Note the large amount of imagination involved, including webbed feet. This image is from their website at <http://www.nap.edu/readingroom/books/evolution98/>. 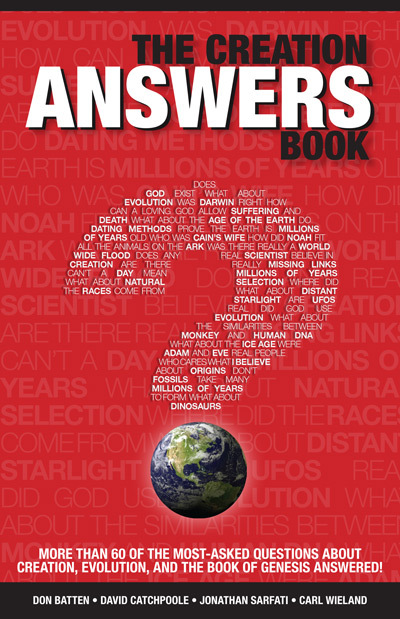 This book has been answered by Refuting Evolution. Some evolutionists have tried to counter this paper by charging me with faking the information presented. There is no deceit (faking), or contradiction, in the article. 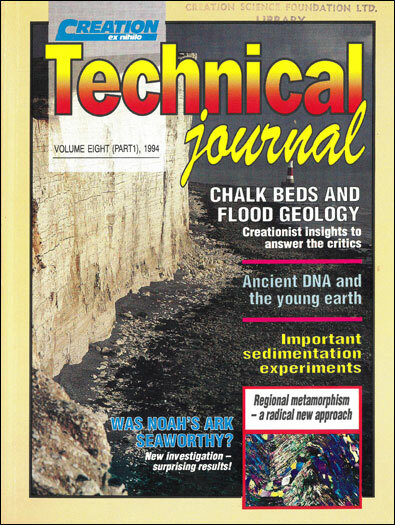 As stated at the beginning of the article, the article on the web was originally published in Creation Ex Nihilo Technical Journal (now Journal of Creation) in 1994, the year Thewissen et al. published their original article. The material referred to is that published by Thewissen in 1994. It is now claimed, on Thewissen’s web site, that more material has been found. As far as I am aware, none of this extra material has been subjected to peer review. That is, it has not been published in a refereed scientific journal. As such, it is not admissible as scientific evidence (evolutionists are quick to demand this of creationists). However, even if it is so published in the future, I don’t have much confidence in the peer review process when it comes to paleontology—there seems to be a different standard applied to these papers, compared to experimental (operational) science. So many false claims have been given credit in prestigious peer-reviewed journals that I have become rather sceptical of all the claims. For example, Gingerich’s Pakicetus story, published in the prestigious journal Science in 1983, was based on some skull fragments. Science even published, on the front cover, an artist’s reconstruction of the whole creature, with legs becoming flippers, swimming in the sea chasing fish for its lunch. It is illustrative to compare this with a more recent reconstruction based on a much more complete skeleton—it is now clearly a terrestrial creature. See Whale evolution? Even if the extra Ambulocetus material on Thewissen’s web site is legitimate, it does nothing to confirm it as a transitional form between whales and land animals. For example, there is no evidence of the development of the horizontal tail flukes so characteristic of whales, or the unique hearing system of whales (i.e. with no opening to the exterior), or the blow-hole, etc., etc. Indeed there is nothing that is uniquely ‘whale’ that identifies Ambulocetus as related to whales. Furthermore, the robustness of the femur, and presence of hooves confirm the creature as a land animal. See A Whale Fantasy from National Geographic for more [by a Muslim creationist posted on the Christian creationist True Origins website]. The supposed sequence from land animal to whale is so clear (I speak ironically) that evolutionists are now contemplating ‘switching horses’ regarding whale ancestry. Mesonychids were long touted as the ‘sister clade’ of whales, with fossils being so interpreted (mainly on the basis of ambiguous tooth and skull characteristics). Now the mesonychids are being questioned as the sister clade, based largely on molecular comparisons of living animals (Nature 404(6775):235–237, March 16, 2000). Of course in all this, one has to allow for the immense propensity of paleontologists for story telling. In a short paper in Nature (395:452, 1998), for example, Thewissen, et al., finished their discussion of whether or not the mesonychians should be considered a sister group to the whales by saying, ‘in any case, extensive convergence or reversals must have occurred in the dentition, basicranium and/or tarsus.’ In paleontological jargon, I interpret this to mean that you can make up any story you like, invoking ‘convergence’ (similarity not due to common ancestry), ‘reversals’, etc., to get the phylogeny you want. If something does not fit the proposed sequence, then it can be dismissed as due to convergence, a reversal, etc. Basically, Thewissen is saying, with a bit of story jigging, they can accomodate the new molecular data. Interestingly, in this paper Thewissen and co discuss similarities in ankle bones in various extant and extinct creatures and how this relates to the phylogeny of whales. But the whole discussion is predicated on the assumption that Pakicetus and Ambulocetus are in the whale phylogeny—and calling something a whale—‘cetus’—does not make it a whale! In other words, the supposed whale transition is not at all clear—unlike the propaganda pronouncements intended for public consumption. Journal of Creation 16(1) will have a thorough analysis of the supposed phylogeny of whales by John Woodmorappe. He exposes the extent of the story telling in this tale of tails (or is it a tale of teeth?). Along with baseless accusations of dishonesty from the misotheists and some of their fellow travellers, I have been informed that the extra material referred to in Addendum 2 above has been published in a peer-reviewed journal (after I wrote the addendum). Please note that the original Perspective, “A whale of a tale”, was published in the peer-reviewed Journal of Creation (then called Creation Ex Nihilo Technical Journal) in 1994, based on the material published at the time. The web archive of this article is part of an archive. Such publications cannot be edited later (that would be a cause for accusations of dishonesty if other than typographical corrections were made). No peer-reviewed journal provides updates to archived papers years later, so we have gone way beyond what any evolutionary journal does to inform readers. 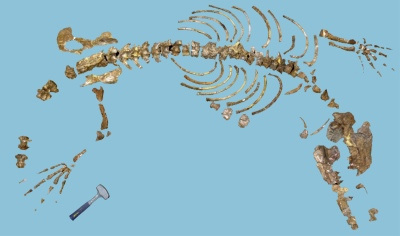 Madar, S.I., Thewissen, J. G. M. and Hussain, S. T., Additional holotype remains of Ambulocetus natans (Cetacea, Ambulocetidae), and their implications for locomotion in early whales. Journal of Vertebrate Paleontology 22(2):405–422, 2002. Figure 1 shows an image of the complete material found, from Dr Thewissen’s website. As has already been said, the extra material does not add one shred of evidence to the story that this creature had anything to do with the origin of whales. Indeed the whole story is seriously unravelling as time goes by. The discovery of a jawbone of a fully aquatic whale (a Basilosaurid) was announced in October 2011.1 This was ‘dated’ to 49 million years ago and since Ambulocetus ‘dates’ from 50-48 Ma, this does not leave much time for some stupendous evolutionary changes. The jawbone predates all other supposed whale ancestors except Pakicetus, which is as much a whale as someone’s pet dog. This list is not exhaustive—think about behavioural changes, underwater communication system, echo-location, navigation capacities, ability to dive to great depths without the bends, etc. How many mutations would need to occur and permeate (be ‘fixed’ in) the evolving whale population to achieve such changes? How often would multiple mutations have to occur together, in a coordinated way, for any advantageous functionality to be achieved? Using calculations published by evolutionists themselves3 (applying the equations of population genetics), which of course make assumptions as favourable as possible to evolution, Sternberg has shown that about all that could be expected in a whale-like population would be two coordinated mutations in about 43 million years. This is about the total time frame claimed for the evolution of all the whales. So the science of population genetics rules out the whale evolution story—even with the millions of years there has not been enough time. There has not been enough time even if we ‘buy’ the claimed evolutionary processes that they claim are responsible for new genetic information—mutations and natural selection (the evolutionary train is actually going in the wrong direction). With the new jaw discovery, the problem is enormously bigger because the millions of years they thought they had have evaporated. New discoveries over time have not been a friend of this story. I expect further discoveries will unravel the story-telling even more, just as it seems to with all evolutionary stories (see the story of Pakicetus, for example). When there is not much fossil evidence available and lots of unrestrained imagination can come to play, evolution reigns. But, inevitably the story runs up against the hard evidence of additional fossil discoveries and the biological realities of what ‘nature’ has to achieve just by chance mutations and natural selection. Finding of the oldest whale fossil in the world: "Antarctic archaeocete", 2011; http://www.dna.gov.ar/INGLES/DIVULGAC/ARQUEO.HTM. Return to text. Listed in print here: Nice Try! A Review of Alan Rogers’s The Evidence for Evolution, Evolution News 27 April 2012; http://www.evolutionnews.org/2012/04/a_review_of_ala058641.html. Return to text. Durrett, R. and Schmidt, D., Waiting for two mutations: with applications to regulatory sequence evolution and the limits of Darwinian evolution. Genetics 180: 1501–1509, 2008. Return to text. Woodmorappe, J., Walking whales, nested hierarchies, and chimeras: do they exist? Journal of Creation 16(1):111–119, 2002. Return to text. Evolution: the Grand Experiment Vol. 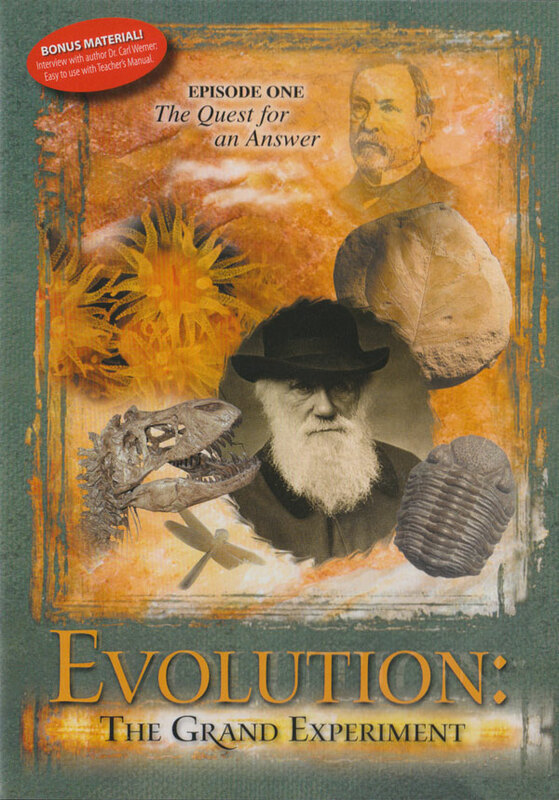 1 DVD; interview of Dr Gingrich by Dr Carl Werner; see also, Batten, D., Rodhocetus and other stories of whale evolution, Creation 33(3):54–55, July 2011. Return to text.